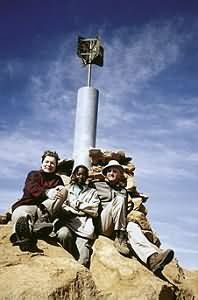 The Königstein Summit (2573m) of the Brandberg Mountain is the highest peak in Namibia. Although the hike is possible all year round, we recommend only the cooler winter months of April to September for the ascent. Special requirements: Good fitness; guest must sign indemnity form and have to provide own medical evacuation insurance in advance. 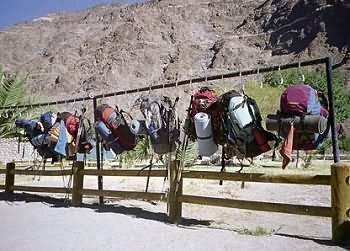 The five day Fish River Canyon Hike is one of the most popular hikes in Namibia. The 85km route starts at Main Viewpoint and ends at the hot springs of Ai-Ais. The hike is only open between 15th April and 15th September due to the summer heat and the possibility of high water level in the rain season. Special requirements: good fitness; doctors medical report which is not older than 40 days; guest must sign indemnity form and have to provide own medical evacuation insurance in advance. General: Clients have to carry weight up to 15kg (all equipment and food is to be shared plus personal belongings). The NamibRand Nature Reserve represents all facets of the Namib Desert like vegetated red dunes in different shapes and colours, endless plains and mountains. Covering an area of some 160.000 hectares a number of former sheep farms were fenced off to create an area where once again the wildlife could roam free in their natural habitat. This desert experience trail shows the diversity of desert organism, adaptation and scenery. The Naukluft Mountains are well known for the day visitor hikes Waterkloof and Olive Trail. 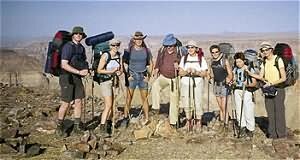 There is also the possibility for a four-day and an eight-day trail for the more advanced and fit hikers. The trails are open from first March to the third Friday in October on Tuesdays, Thursdays and Saturdays of each week. The accommodation at the overnight stops on the trail consists of stone built shelters and a hut. No showers are provided.